New Super Eagles head coach, Gernot Rohr took charge of the team for the first time on Tuesday in Uyo ahead of Saturday’s 2017 Africa Cup of Nations qualifier against Tanzania. 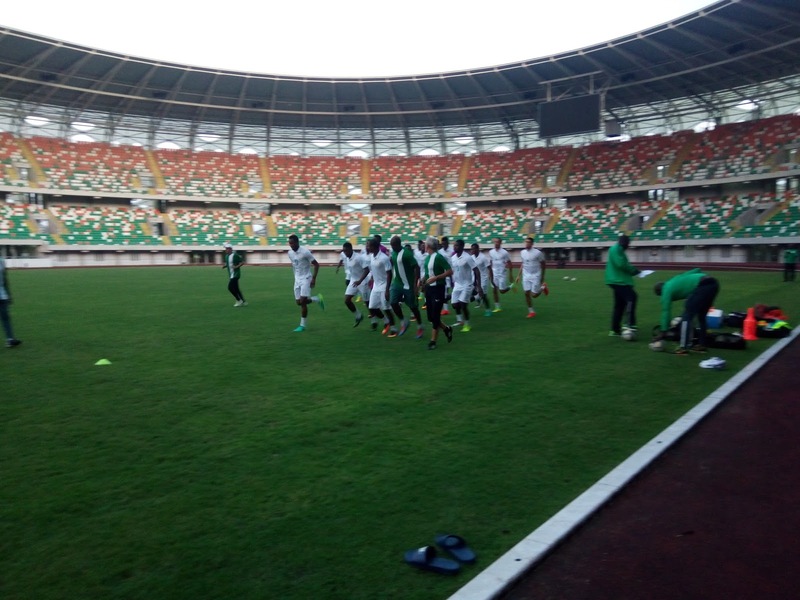 Twenty Super Eagles players trained at the MAinbowl of the Gosdwill Ajkpabio Stadium led by captain, John Mikel Obi and assistant, Ahmed Musa. Others who were part of the session were Emmanuel Daniel, Ikechukwu Ezenwa, defenders Musa Muhammed, Chidozie Awaziem, Abdullahi Shehu, Jamiu Alimi, Leon Balogun, William Troost-Ekong and Elderson Echiejile, midfielders Ogenyi Onazi, Wilfred Ndidi and Nosa Igiebor and forwards Brown Ideye, Imoh Ezekiel, Kelechi Iheanacho, Victor Moses, Odion Ighalo and Victor Osimhen. The training session on Tuesday lasted for less than thirty minutes as it was just a light work out and stretching exercises. The team will have a training match against Akwa United on Wednesday at 5pm. Gernot Rohr and a number of players could not fly to Uyo from Lagos on Monday as ARIK airline eventually cancelled their flight after many hours. But the entourage landed in Uyo just after noon on Tuesday. 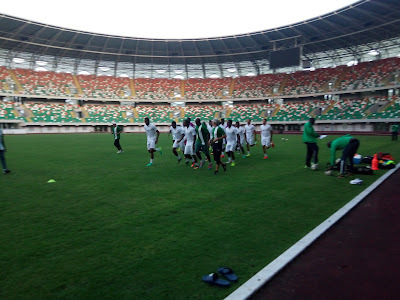 On arrival at the team’s Le Meridien Hotel, Rohr had a meeting with his assistants, backroom staff and players present, before the evening’s training session at the Godswill Akpabio Stadium.